Are you up to speed on the basics of safe canola storage? Take the quiz to find out. How to tell when uneven crop is ready to swath? How much canola does your combine throw over? Canola growers often lose 2 bu./ac. out the back of the combine, and losses can easily reach 5 bu./ac. if the combine is pushed beyond its threshing capacity. 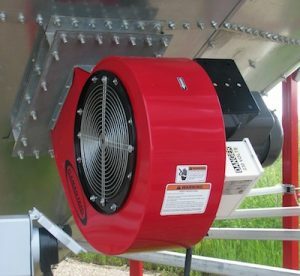 Every combine will have a sweet spot where the settings and ground speed are just right for the conditions and losses are within the acceptable range of 0.5-1 bu./ac. Verticillium wilt was found in a canola field in Manitoba in 2014, and a survey of approximately 1,000 fields across Canada is underway this summer and fall. Canola rarely has an issue with storage insects. Primary stored product insects such as rusty grain beetle, red flour beetle and saw-toothed grain beetle can occasionally be found in stored canola if cereal grain or weed seeds are mixed in with the canola. Mites can carry mold spores that can build up in warm and moist canola, contributing to heating risk. Canola that goes into a clean bin will not usually encounter a problem with stored grain insects. Many growers who have tried straight combining canola often see no clear advantage or disadvantage when it comes to yield. The value of eliminating the swathing step is enough for many, even if it means an added step to apply a harvest aid such as glyphosate, Heat or Reglone. This article looks at situations where swathing may still have an advantage over straight combining. 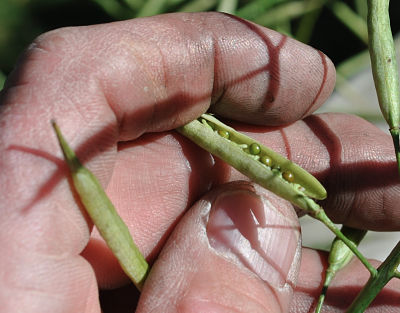 Frost hits standing canola: What to do? Check standing canola the morning after a frost, but wait at least 4-6 hours after frost to allow the full extent of severe frost damage to become evident. The crop may look undamaged that morning but by lunch time, wilting, desiccation and pod splitting may begin. If you scout early and then not again, you may underestimate the damage and miss a chance to swath now to save some of the yield. Conversely, light to moderate frost damage may take longer to become evident, so scout again after 2 to 3 days to reassess and make a decision. 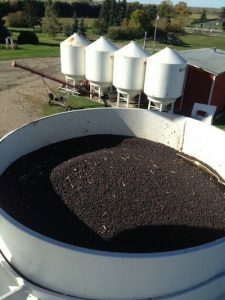 Does straight cut canola require a dry down product? Herbicides can be used to desiccate or dry down green weeds or crop to facilitate straight combining. Here are the choices and how to use them.